In less than a year, the International Maritime Organization (IMO) will initiate new regulations designed to reduce Sulphur oxide emissions produced by ships. This global fuel Sulphur cap is part of a greater response to reducing the air pollution impact of the global shipping industry and will go into effect on Jan. 1, 2020. The rules will reduce the cap on allowable emissions from current 3.5 percent to only 0.5 percent. It’s estimated that as many as 70,000 ships will be affected by these regulations. Convert ships to operate on cleaner liquefied natural gas (LNG) as fuel. The first option, which involves installing scrubbers, is a stop-gap solution that helps ship owners meet the new requirements, but has several drawbacks. Scrubber units undergo high wear and tear, need additional electric power on board, and may produce back pressure that can strain engines, and create an additional waste stream of the collected pollutants that requires proper management. Additional training of crews is necessary to properly dispose of the Sulphur collected by scrubbers. Failure to handle the waste properly will result in fines. On top of all of this, the IMO has pledged to reduce the total annual greenhouse gas emissions produced by the shipping industry by at least 50 percent by 2050, and to reduce CO2 emissions per transport work by at least 40 percent by 2030. Scrubbers, which come at a great capital investment, will not help ship owners meet these future goals, meaning additional investments will be needed in the not-so-distant future. The second option requires ship owners to “do nothing” other than continually invest in potentially more expensive fuels that contain reduced amounts of Sulphur. This option allows operators to comply with the new regulations but does nothing to prepare owners and operators for the IMO’s forthcoming, more stringent regulations. The final option is a viable solution that allows ship owners to invest in a solution that meets the 2020 regulations and readies their fleets for future and more stringent IMO Sulphur content requirements. Converting ships to LNG also sends a strong message to the market about the owner’s commitment to innovative, proactive and “green” operations. Read on to learn more about converting ships to LNG. Natural gas is a naturally occurring compound that can be used as a fuel source. When natural gas is cooled to a temperature of approximately -160°C at atmospheric pressure, it condenses to LNG. This cooling process reduces the product’s volume by a factor of more than 600 times, making it more efficient to transport over long distances via cryogenic tanks and ships. 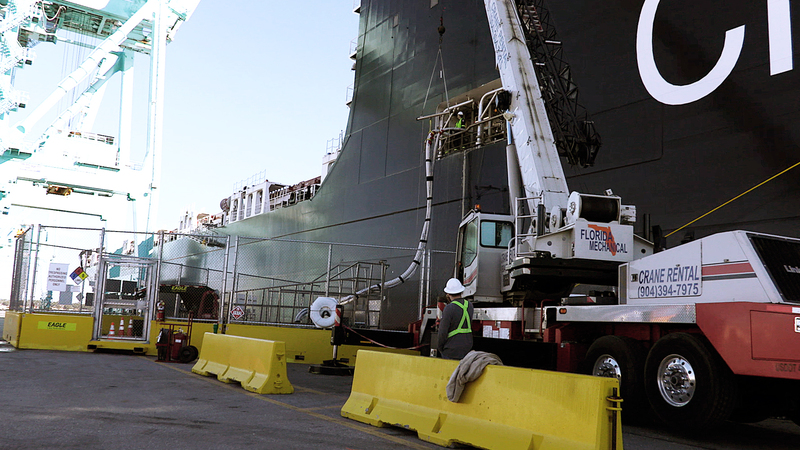 Once delivered to its destination, LNG is warmed back into its original gaseous state for use. Read more about the properties of LNG here. A 20- to 25-percent reduction in carbon dioxide (CO2) emissions. a 100-percent reduction in Sulphur(SO2) and fine particle emissions. LNG is also abundant, reliable, safe and cost-competitive, as explained in detail here. When converting ship operations to LNG, there are several main factors for owners to consider, including fuel tank placement, whether to convert engines or buy new, how to source LNG. The first of these considerations involves ensuring sufficient space for supply tanks on board. By nature, LNG is 60 percent greater in volume than diesel and, as such, the tanks require a more space on vessels. 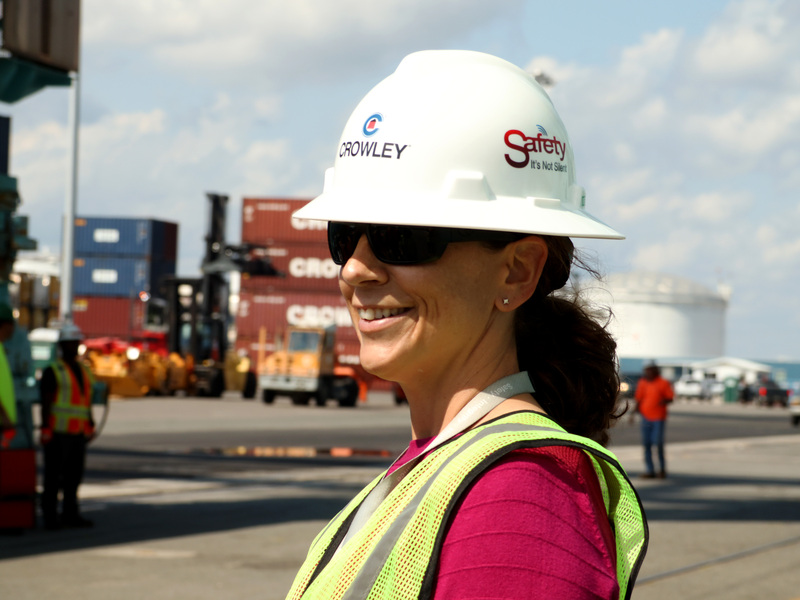 Crowley’s Alisa Praskovich (shown below), manager, LNG business development, says while all LNG conversion projects present unique challenges, smaller vessels can be more of a challenge due to the lack of available space for installation of LNG fuel tanks. Nonetheless, in light of the potential fuel savings in using LNG, vessel owners should at least consider conversion, assuming the vessel will be operational for years to come. “Recognizing that some challenges exist with the conversion of smaller ships, Crowley is working with regulators, OEMs and customers to develop innovative solutions that allow owners to convert vessels over to dual fuel and meet the 2020 emission requirements,” Praskovich says. Another consideration includes regulations that state LNG cannot be placed in a vessel’s wing tanks or double-bottom tanks, but instead must be placed in independent containers. When it comes to deciding whether to convert existing engines to run on LNG or to buy new, customers must evaluate the age and condition of their current engines, as well as the size of the generating sets, among other factors. Marine engineers, such as professionals at Crowley subsidiary Jensen Maritime, are experienced in the placement of LNG storage tanks that meet U.S. Coast Guard and international regulations, and can help customers determine the ideal location aboard any given vessel for optimum access, vessel stability, visibility and safety. The final major consideration is how customers will source a steady stream of LNG to fuel operations after a conversion is made. Crowley has developed a streamlined approach to this challenge that provides marine customers with convenient “flange to flange” LNG solutions. This means Crowley customers have access to not only Jensen’s LNG vessel design experts, but also to the company’s LNG engineering, sourcing, logistics and marine bunkering services. 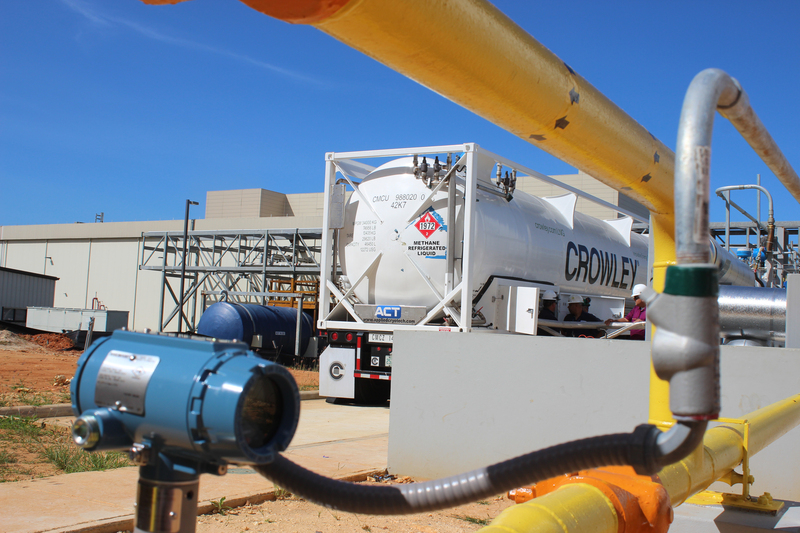 From designing the bunkering vessels or shore-based LNG supply solutions, to sourcing and transporting the LNG, Crowley can make it easy for customers ready to make the switch. Crowley is one of the few companies that can offer a full suite of LNG services that helps marine operators achieve their clean energy goals. As owner and operator of the world’s first dual fuel container/roll-on roll-off ships (ConRos), Crowley continues to build its expertise across all spectrums of LNG within the company's business units, including LNG supply, contracts, vessel design, construction management and marine bunkering. Ship owners ready to take charge of their emissions performance for 2020 and beyond should contact Crowley for a consultation. Get started by contacting Crowley here.